Lords Online is a browser-based flash game that utilizes the classic combat rules set down in Advanced Dungeons and Dragons. And it has been deemed the 2nd generation in browser-based gaming. Lords Online provides two map modes to choose from: Lord mode and Hero mode. Those who love the detached SLG style can use Lord mode and focus their attention on city development and arms coordination, while those who prefer RPGs can choose Hero mode and experience epic adventures. The people of Alec broke away from the Shaba tribe centuries ago and have since grown into a strong community that prizes magical knowledge above physical strength. Much more peaceful than the Shaba, they have adquired the curiosity and wisdom of the humans and used it to enhance their mana skills. Sensing possible weakness, the Bilde attacked the Alec first, hoping to wipe them out before confronting the Shaba. However the Bilde underestimated the power of the Mages in Alec, and what was supposed to be a prelude to war has devolved into the bloody front lines of an enduring conflict. With their tall, strong bodies, it is easy to write them off as mere labor or warriors. In fact these people have a long history and a culture that prizes bravery and glory in battle. When the Bilde attacked Alec and started the war that has consumed the continent, the Shaba mobilized their fearsome warriors and began preparing for war. Kos country stretches out among the fertile flatlands of God’s Favor Plain and is home to the humans. Without the strong bodies and powerful mana skills of the races, they are considered to be a relatively weak race, but their wisdom and intelligence are often overlooked, and is the principle reason they have taken over the plains. They were also the first races to unite and fight together and the first to create mechanical weapons. The exquisite graphics featured in Lords Online form a fantastic game world where you will spend countless hours roaming and conquering the land. Among other browser based games, Lords Online stands out as particularly good, with fine detail included in the verdant landscape. Lords Online takes a realistic approach to governing, giving players the ability to deal with various political affairs, such as comforting citizens after attacks or disasters, collecting taxes, producing resources for military and economic use and so on. Can you manage the situation at home while also engaging in battles against foreign enemies? The specially designed alliance system enables players to ally with others and fight against their enemies together, which enhances player interaction and fosters the growth of a passionate community. Is a strategic war game, but it also includes many aspects of RPGs, which is the leveling and cultivation of heroes. Heroes are a crucial part of an army, as they are on the front lines providing leadership and guidance to troops. Heroes can earn experience, increase stat points to upgrade skills and be equipped with various kinds of armor, not to mention the special skills and magic that are available. Lords Online breaks the mold of traditional browser games. With features that include cultivation of heroes, equipped armor, legions of military units, plundering , alliance building, and governing functions, Lords Online provides players with a truly memorable experience that will keep them coming back for more. Experience the browser based game that plays like an MMO today! Each of the three races in Lords Online has 10 military divisions. 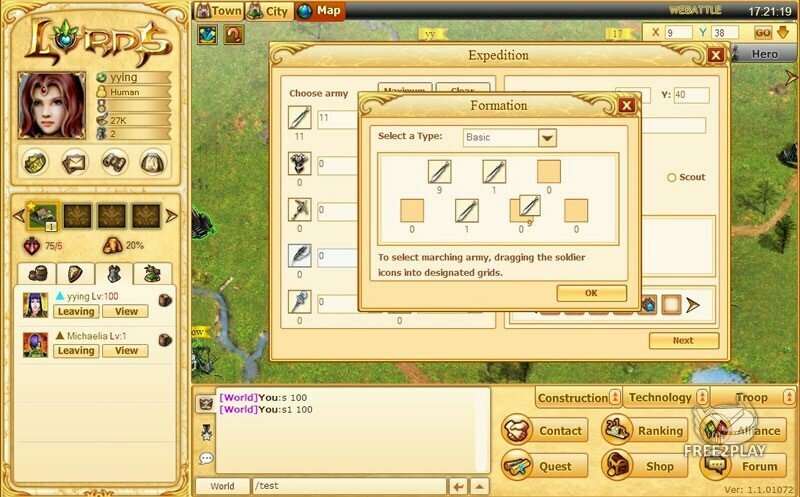 With 30 military divisions, the unique siege war system, legions of heroes, reinforcements, scouts, and plundering there are countless strategies to master and an almost unlimited variety of attacks. Fight with hand to hand, or with ranged and mana based spells or send an armada to wipe out the opposition. It’s all up to you.